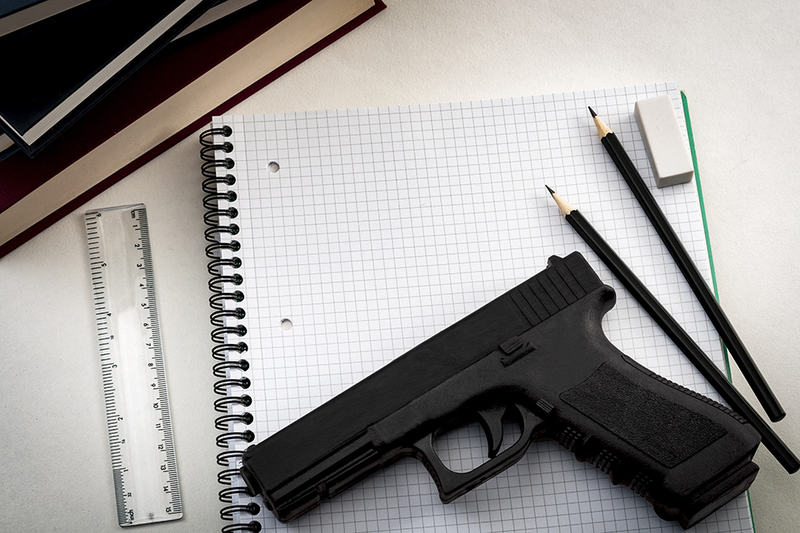 A survey of educators from across the country by CSUN social work professor Lauren Willner found that teachers overwhelmingly object to arming teachers a way to deter school shootings. Photo by iStock Moussa81. In the year since a gunman opened fire on students, faculty and staff at Marjory Stoneman Douglas High School in Parkland, Fla., and killed 17 people, politicians have suggested arming teachers as one way to deter school shootings. But is that what teachers want? The answer is “no,” according to a survey of more than 2,900 current and former teachers across the country conducted in the weeks following the Parkland shooting by California State University, Northridge assistant professor of social work Lauren Willner. Willner said she was inspired to conduct the survey when she noticed a glaring omission in the arguments people were making about putting guns in the classroom. Willner noted that in 2018 alone, 23 school shootings took place — the highest number for any year on record. Willner asked educators teaching in academic environments from preschool to college what they thought about arming teachers. She sent her survey via email, social media and to group email lists and newsletters of several educational organizations. She received responses from 2,926 educators from all 50 states and the territory of Guam. The states with the most respondents were California, with 11.4 percent; Washington, with 5.9 percent; New York, with 5.3 percent; Ohio, with 4.6 percent, and Pennsylvania, with 3.2 percent. The sample was overwhelmingly female, reflecting the overall teacher population, which is disproportionately made up of women. High school teachers and professors in higher education settings made up approximately 60 percent of the respondents, and nearly half of the preschool through high school teachers identified their school as being in a suburban setting. Only 16 percent of the respondents reported owning a gun, and 25 percent indicated having more than minimal experience using a firearm. Among teachers surveyed who were gun owners, just greater than 16 percent of the study sample, only 11.5 percent said they believed being armed while teaching should be part of a teacher’s responsibilities, she said. When asked about the effectiveness of arming teachers as a means to prevent school-based gun violence, Willner said the majority of those surveyed did not believe doing so would prevent someone from entering a school with the intent to commit harm. Conversely, she said, the majority of the participants believed that arming teachers would lead to unintended violence in schools, including mistakenly firing a gun during an active-shooter drill. Willner said 64 percent of the survey’s respondents believed overall school safety would be compromised if teachers were allowed to carry firearms in the classroom. Willner noted that there is legislation in several states that includes funding for training teachers and other school staff in handling guns. She asked the survey’s respondents if they were interested in receiving such training. Just over 11 percent expressed an interest, and only 7.9 percent said they believed marksman training would provide them with adequate preparation for successfully handing a school-based active-shooter situation. Willner is sharing the results of her survey with policy makers, educational organizations and others involved in the discussion about guns in schools. She is planning to expand the project with a mixed-methods follow-up study examining how teachers understand school-based violence and what they believe to be the solutions to the problem. She also is working on an academic journal article based on the findings of her survey.